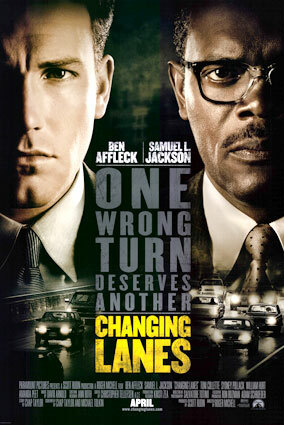 Changing Lanes is a powerful film and probably the best role Affleck has yet had, with a moving performance by Samuel L. Jackson as a deeply flawed, humdrum yet somehow passionate ex-alcoholic insurance salesman who's trying to buy a house to persuade his wife to remain in New York with their two little boys. The plot is a bit too high powered, depicting as it does a pumped-up battle between the two men when a car crash fatally delays Jackson's character from a custody hearing and leads Affleck's to leave his key 'power of instrument' document in Jackson's character's hands before another hearing, in his case to determine the legitimacy of Affleck's powerful law firm's control over a huge charitable trust which its founder's daughter disputes. Through the course of one day the two men battle each other with imagination and reckless abandon. It's more than a little implausible what they do. But questions like why there would be only one copy of that 'power of instrument,' as well as the big one as to why the two men would both try such desperate measures against each other, are kept at bay by quirky photography and constant, well timed cuts that keep the scenes continually so interesting that I was on the edge of my seat from first scene to last. Sidney Pollack, as in Eyes Wide Shut, plays the role of a rich and powerful man who bends morality, and he's awfully good at that. Affleck is, in a way, just a big lug, an overgrown baby, a boyish bully, but there's a confusion and vulnerability about him that for the first time in one of his big roles invites genuine sympathy. Jackson's performance is restrained, neutral, without any of his usual mannerisms. He loses himself in the role, and it's a seamless, elegant performance. He has a sad, bloated look, and when he sits for an hour staring at a glass of bourbon in a bar without touching it the improbable event seems believable because there is such a sense of powerful repression in his characterization. Affleck contrarily is loose, flabby, exposed, like a spoiled prep school boy who's discovering that the world is not his oyster after all. Some of the philosophical moments - especially Affleck in a Catholic church railing at a father confessor about the unfairness of life - are excessive, but the movie succeeds in keeping the volume turned up so consistently that such moments blend in. I knew I was being manipulated shamelessly, but I stayed in thrall. The moral issues brought up are pretty interesting and treated not unintelligently, however over-inflated the plot. Roger Mitchell is a director worth watching.